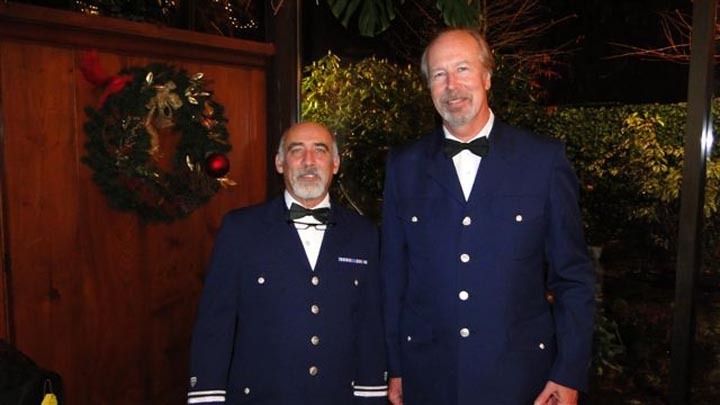 David Pothier and Chris Scott, Coast Guard Auxiliary. David Pothier and Chris Scott have been elected officers in the Coast Guard Auxiliary Division 11. The pair received the honors during a Change of Watch Ceremony held on Cape Cod this month. Mr. Pothier of Oak Bluffs was elected vice flotilla commander for the Woods Hole and Martha’s Vineyard Flotilla, 11-2. He will also serve as detachment leader for the Martha’s Vineyard Auxiliary. Mr. Scott of Edgartown was appointed division staff officer for public affairs. He will assume public information responsibilities for the region. The Coast Guard Auxiliary Division 11 serves the Cape and the Islands. Its nearly 300 members perform free vessel checks, serve as administrative and communications watch standers at area Coast Guard stations and patrol area waters from the Coast Guard both on the water and on the air.